The time before and after pregnancy are vital to the mental and physical health of mothers and children, and their families. Brisbane South PHN recognises that health care should be easily accessable, personalised and supportive during this particularly busy time. This section includes details of perinatal health initiatives supported or commissioned by Brisbane South PHN and includes a list of relevant resources for health care professionals. A significant focus of these programs is to ensure that primary health care (general practitioners, local child health services, obstetricians and paediatricians) is linked to improve continuity of care throughout the entire perinatal period. 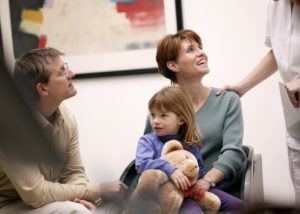 This page is for primary care health professionals who need to connect with maternity services or services specifically for children and young people. • advice on local community services. In an attempt to improve immunisation rates and to encourage parents to take their children to have regular health checks, parents will receive reminders via SMS. Mothers of new babies are offered the Service when they ‘check in’ at the hospital to give birth and are enrolled to participate upon signing the consent form. Those who reside outside the Brisbane South PHN region can be referred to Children’s Health Queensland – Child Health Service via our referral page. Click here to visit the new Maternity Shared Care page. The mental health and wellbeing of parents has impacts on the health of the whole family, including children and parents alike. Adjusting to parenthood can be frustrating and overwhelming, leading to stress, anxiety and depressive symptoms. It’s important to keep new parents and carers emotionally and physically healthy during pregnancy and after birth. If left unrecognised, these feelings and experiences can lead to mental health disorders such as anxiety, depression, or a combination of both. Perinatal mental health is a priority issue facing the Brisbane South PHN community. Possums for Mothers and Babies has been commissioned by Brisbane South PHN to connect and strengthen existing perinatal and maternity services within the Redland region. The program aims to improve the overall perinatal wellbeing of mothers and families by building capability across the local health and wellbeing service sector by ensuring that mothers and families at risk of perinatal anxiety and depression, receive support and advices that develops resilience and self-help skills to navigate the perinatal time. Local health clinicians (general practitioners, midwives, child health services), community workers and volunteers will have the opportunity to engage and participate in the Possums education program. The program equips clinicians with evidence-based research on how to best support new parents with everyday issues, and assist clinicians in connecting parents and families into a support network within the Redland region.